Refurbished D7000v2 - May show signs of light use, Maybe with or without orignal box, 100% tested & running Netgear's latest firmware. Please Note: This is a VDSL/ADSLModem Router, THIS WILL NOT run a VPN Client ! This is an ideal choice to use in as a single Modem ADSL/VDSL Router or as Dual Router Configuration with one of our other VPN routers like the NETGEAR R7000. Netgear Nighthawk AC1900 Wi-Fi VDSL/ADSL Modem Router is a perfect replacement for Modem Router or Router provided by your Service Provider. Auto detection wizard gets you online in a matter of minutes for your Fibre Internet provider using Phone line. With your own device, you can enjoy Wi-Fi speeds up to 1.9 Gbps and a powerful dual core processor for performance. High powered amplifiers, external antennas and Beamforming+ improve range and reliability. Nighthawk supports ADSL / ADSL2 / ADSL2+ and VDSL / VDSL2 technologies. 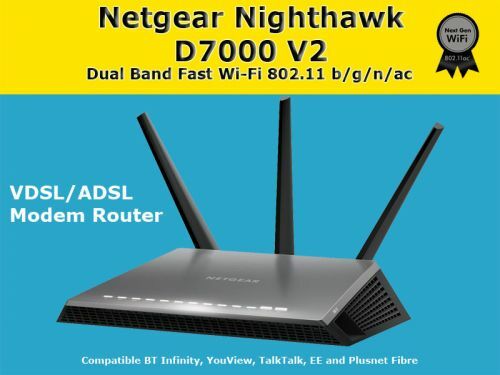 With speeds of up to 1.9 Gbps the Nighthawk D7000 Supports ADSL/ADSL2/ADSL2+ and VDSL/VDSL2 and is compatible with any Internet service provider via the Gigabit Ethernet WAN port so you can future proof your network. In addition to faster and more reliable Wi-Fi connectivity, Nighthawk also provides advanced features to make most of your home network – remote access using OpenVPN, personal secure cloud using Ready Cloud , remote router management using genie App, reliable backup to USB HDD.